In many writing classrooms the year starts off with children sharing personal memories and writing stories and teachers modeling how to find stories if stuck, how to tell a story sequentially, and how to elaborate a story using step by step actions and descriptive details. There are a few key charts you may want to consider making with your students to support this ambitious work – a writing process chart, a strategy chart, an exemplar chart, and a conventions chart. Helping children understand that writing is a process is important work, especially at the beginning of the year. Donald Murray, author of A Writer Teaches Writing (1968, 2004), first described this process as a way of breaking down writing into understandable steps, to show how writing is made so he could teach others. Writers collect ideas, draft, revise, and edit. While there are many variations of the writing process this is a good basic one to teach our young writers. It lets them know that writing is not perfect the first time pictures and words are put down on paper, that it takes lots of starts and stops, trials and errors, before it ends up published. 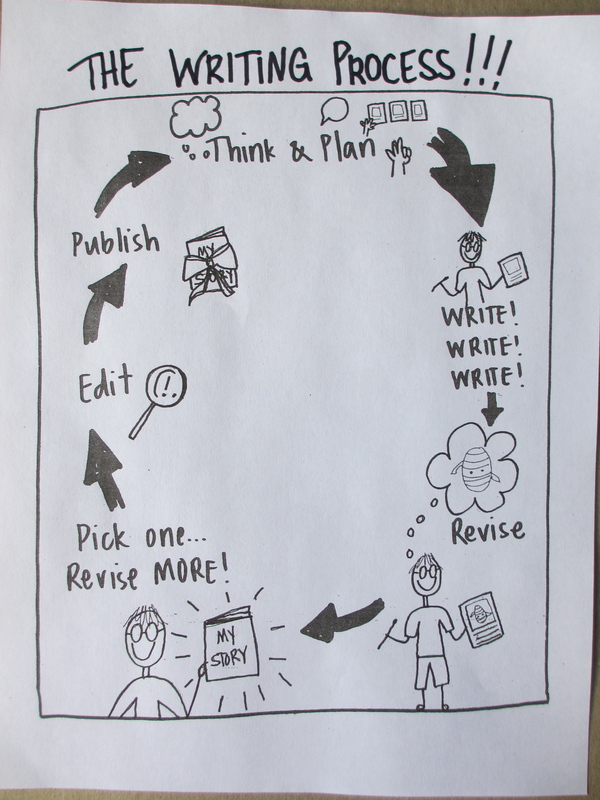 We typically show the writing process as a circle to emphasize its endlessness, although we know that that there are many times writers jump around for example from revising to editing, then back to more revising. The most important thing we want our student writers to know is that when a writer finishes one piece the cycle starts all over again. 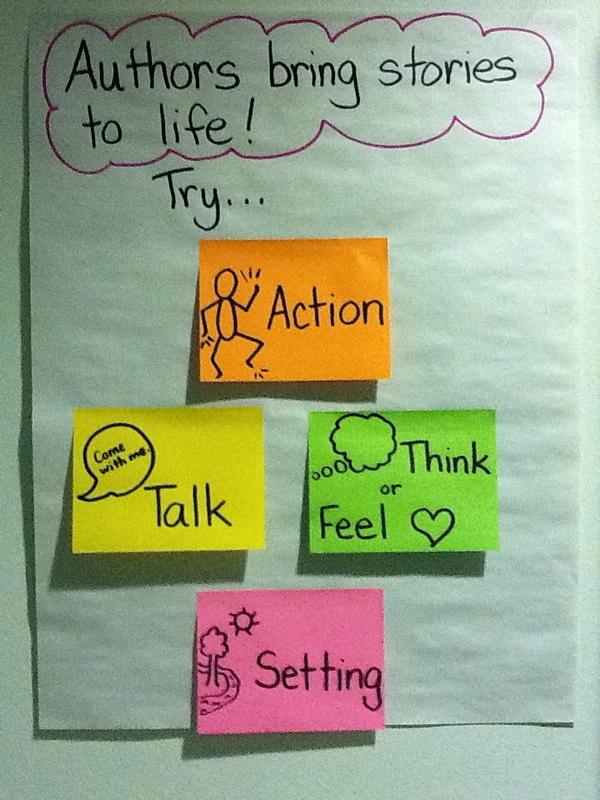 Below is a chart that Kristi made that continues to be a favorite of many teachers. A possible writing process chart. Another chart you will definitely need is a strategy chart, or what we now refer to as a repertoire chart. As we described in Smarter Charts, this kind of chart records a list of strategies for a big skill, which allows children to self-select the strategy that matches what they need to do. It also typically grows over multiple lessons. Increasing children’s skill of elaboration is one goal that encourages revision. 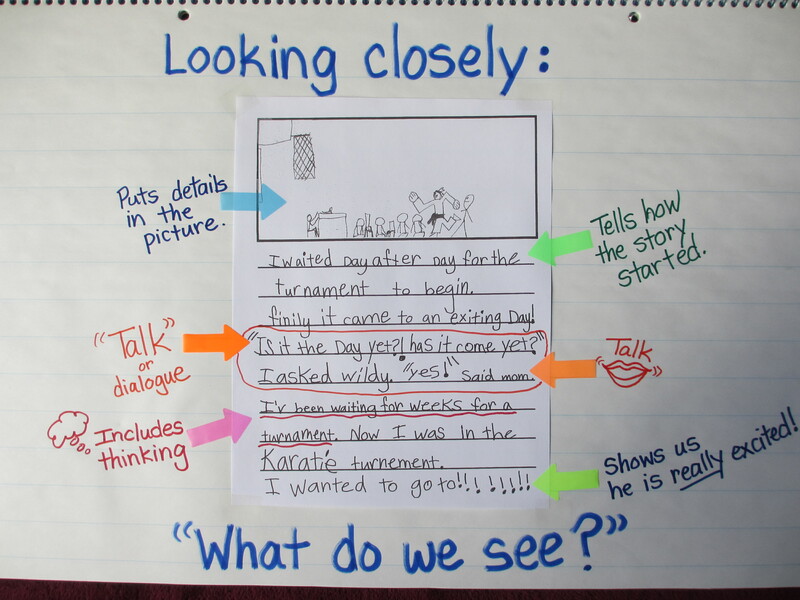 Setting clear expectations for what a well-written story looks and sounds like is best accomplished by showing children examples of books written by other children their same age. Then, by looking at the exemplar piece of writing together and naming what the writer has done to make it so good, can really underscore all that you have been teaching and even provide ideas for other things to teach and for students to learn. Once the piece of writing is annotated it becomes an exemplar chart that children can compare their own writing to or refer to when looking for other things they could try. A writing sample that has been annotated with the students’ noticings. Editing is an important part of the writing process because writing is meant to be read by others. This means that writers work hard to make their writing easier to read by trying to make their pictures clear with enough details to show what is happening and where. 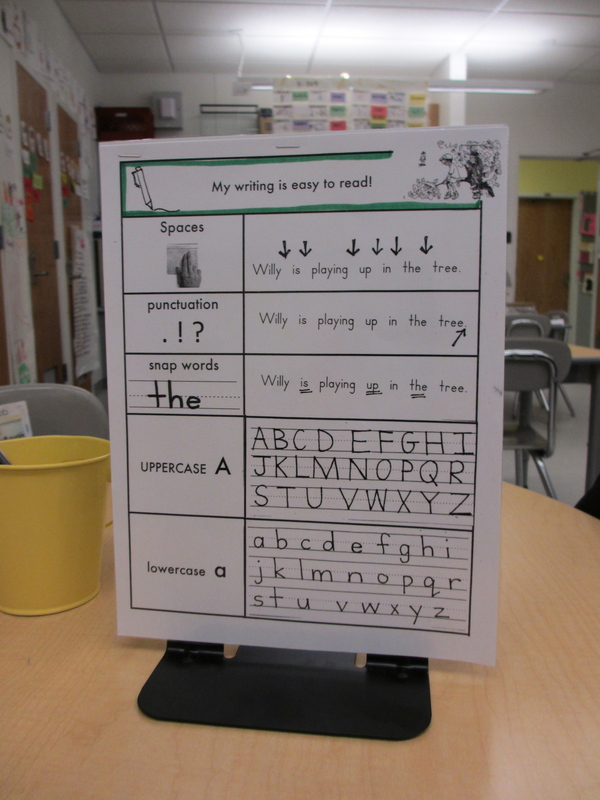 They also write in a way that makes the words easier to read, like using spaces, punctuation, and the best spelling they know how to do. Creating a chart that highlights strategies for these types of conventions will be a useful tool for all your students. This is the type of chart that is often turned into an editing checklist to be used regardless of genre. When deciding which charts you will need it always helps to start with the big goals of your unit and to use these as your guide for selecting which charts might be needed most. Too many charts can be overwhelming and become more like print pollution than helpful scaffolds. And, as with any chart, make sure you and your students refer to each chart often, celebrating their use by all.